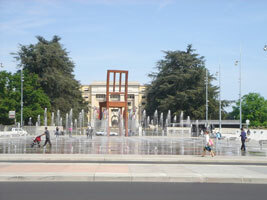 To accommodate the delegations meeting during the sessions of the League of Nations after First World War and those of the European seat of the United Nations with its thousands of diplomats after World War II, the Canton authorities provided facilities to the west of the city around the park of the Ariana. Before its integration into the city, this hill had been used as a resort as early as the end of the seventeenth century when rich families spent a few weeks there in their summer houses. Old properties have been restored and new office buildings have been erected on former farm-land of this now densely populated suburb. The tour intends to show the radical transformation of this area during the past century and the main international organizations.